I've seen this pair of heels before and I fell in love but wasn't sure if I could pull it off. The color is so different from my wardrobe, my personality, my everything lol. 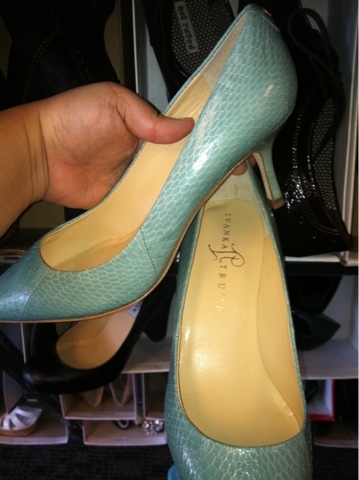 I'm also not so into that reptile looking products, so this was weird that I actually liked this pair of heels. These are from Mr. Trump's daughter, Ivanka Trump's shoe collection. I didn't see it on her website, so I'm thinking its from an older collection, but who cares right? I Love love the color. It has a turqouise color to it in my opinion. The heel size isn't so high, so perfect for anyday outing without my feet failing on me. I felt comfortable in it, however it was a bit small for my wide feet (thanks to my mama). The price was alright, still a little pricey but I guess it is from the Trump family so it doesn't matter. Like last time I didn't buy it. Maybe the third times the charm?? We shall see. Have you tried Heels from Ivanka Trump? Should I get these? Help a girl out!! Those are cute! Did you get them?